According to current forecasts, California has a 93% chance of an earthquake of magnitude 7 or greater occurring by 2045. California earthquakes are a geologic inevitability. The state straddles the North American and Pacific tectonic plates and is crisscrossed by the San Andreas and other active fault systems. The magnitude 7.9 earthquake that struck off Alaska’s Kodiak Island on Jan. 23, 2018, was just the latest reminder of major seismic activity along the Pacific Rim. California occupies a central place in the history of seismology. The April 18, 1906, San Francisco earthquake (magnitude 7.8) was pivotal to both earthquake hazard awareness and the development of earthquake science – including the fundamental insight that earthquakes arise from faults that abruptly rupture and slip. 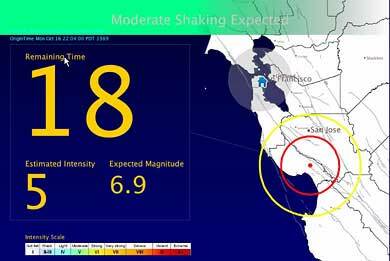 The San Andreas Fault slipped by as much as 20 feet (six meters) in this earthquake. 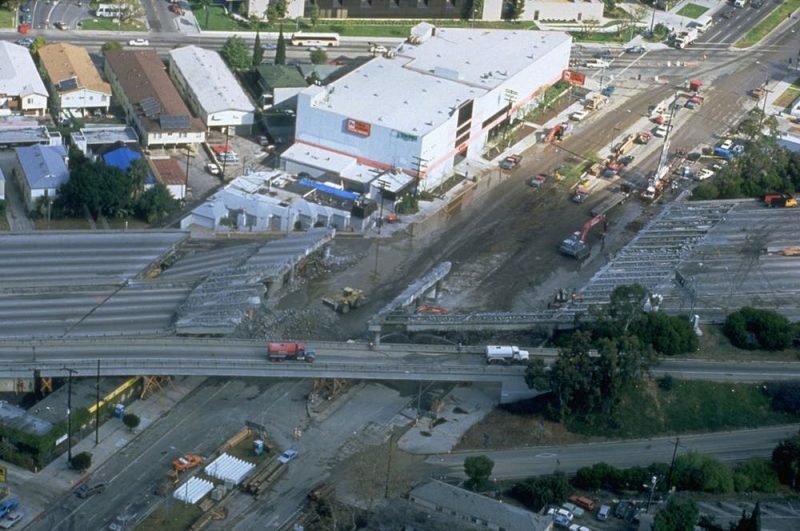 Collapsed Santa Monica Freeway bridge across La Cienega Boulevard, Los Angeles, after the Northridge earthquake January 17, 1994. Image via Robert A. Eplett/FEMA. The 1906 San Francisco earthquake was the last quake greater than magnitude 7 to occur on the San Andreas Fault system. The inexorable motions of plate tectonics mean that every year, strands of the fault system accumulate stresses that correspond to a seismic slip of millimeters to centimeters. Eventually, these stresses will be released suddenly in earthquakes. 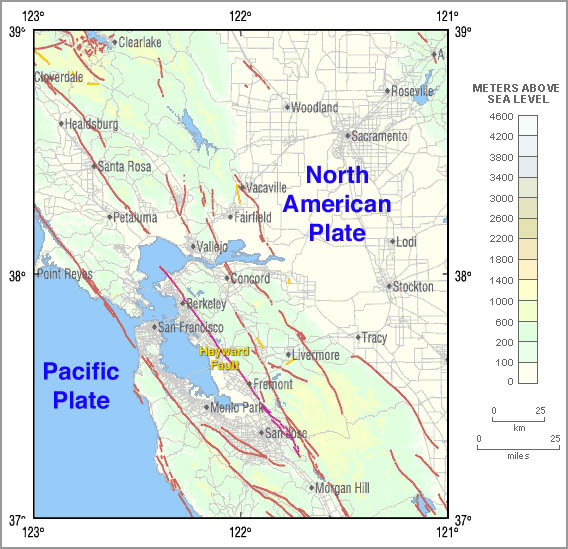 English: w:en:Hayward Fault Zone map, derived from USCGS 122-38 image. http://quake.wr.usgs.gov. 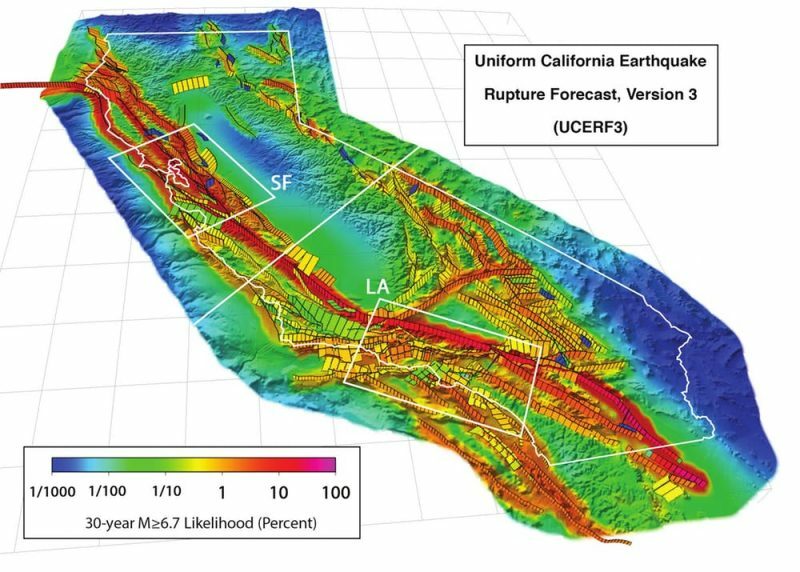 Perspective view of California’s major faults, showing forecast probabilities estimated by the third Uniform California Earthquake Rupture Forecast. The color bar shows the estimated percent likelihood of a magnitude 6.7 or larger earthquake during the next 30 years, as of 2014. Note that nearly the entire San Andreas Fault system is red on the likelihood scale due to the deficit of large earthquakes during and prior to the past century. Image via USGS. Above: Remington Elementary School in Santa Ana takes part in the 2015 Great California Shakeout. The earthquake risk requires a resilient system of social awareness, education and communications, coupled with effective short- and long-term responses and implemented within an optimally safe built environment. As California prepares for large earthquakes after a hiatus of more than a century, the clock is ticking.